Disclaimer: I ate and drank for FREE at the Commoner on the night in question. ‘Twas the night before the anniversary of that guy being nailed to a cross. Some call it Maundy Thursday, but in my ten years of Catholic education, I never learned the meaning of Maundy – it always sounded rather drab laundry, like dull greyish white socks which hadn’t been washed with enough bleach – so it was a pleasant twist when I received an invitation to the Commoner’s launchy Thursday for their April themed event. They’re running different events throughout the year, all with delightfully dorky punny names based on movies. ‘Claws’ = Jaws, but instead of sharks, they’re serving crustacea. I was allowed to bring a +1 to the launch, but with it being the night before an extra long weekend, many of my friends already had plans to be away. Thankfully, the hard-working @thatjessho was stuck in town and on good behaviour, as she was working on (not-so) Good Friday. So she happily came along, and it was a good chance for the two of us to catch up over free flowing Red Claw pinot gris and invertebrate canapes. First up were lobster custard cigars. Oh, and by the way, if you want pretty pictures, there were a host of other bloggers at the event, including @msihua @ironchefshellie and @myfoodtrail, so I’m sure you can find much better lit (Jess and I resorted to lighting the food with our phone screens for one another) and framed photos. Anyway, these cigars were a nice way to start the evening – a cold savoury custard with little chunks of lobster meat piped into crisp and slightly crumbly cigars. The custard was a little too salty for my liking, but I’m quibbling; they were pretty good. The next item was a crayfish, lobster and scallop terrine, wrapped in smoked salmon, on melba toast. I liked the texture of this; the terrine wasn’t an amorphous mass, and had nice big chunks of shellfish in it. By this stage, I was craving something warm, and right on cue, these soft-shelled crab sliders arrived. They were quite good, but there were tweaks that Jess and I both agreed we would have made. First of all, the little round buns were cute, but the height of them meant there was too much bread when compared to filling. The other thing was that the remoulade (I can’t remember if it was celeriac or fennel) was a classic accompaniment, but the saltiness of the crab still required something with more acid or cream to temper it. We concluded it needed mayo. Prawn cocktail with a Bloody Mary sauce. Well, prawns with a Bloody Mary, really. The prawns were wonderfully fresh, and cooked perfectly, but the standout was actually the Bloody Mary. It was mixed expertly, in the thicker style befitting its use as a sauce, yet still balanced well with spice and lemon, so it didn’t have the heavy feel some Bloody Marys have; instead, it was bright and fresh. Then came the highlight of the night, in my humble opinion. Beer-battered scampi with french fries. The scampi were amazing. Fried until they’re just done, so the flesh was still bouncy and succulent, and hadn’t lost any of the fresh sweetness that often disappears when you overcook seafood. The accompanying fries were miniature and cute; they reminded me of the packet Smith’s french fries I used to eat as a kid. I don’t mean that in a bad way. They were a good vehicle for the aioli (or was it tartare? I can’t recall exactly). 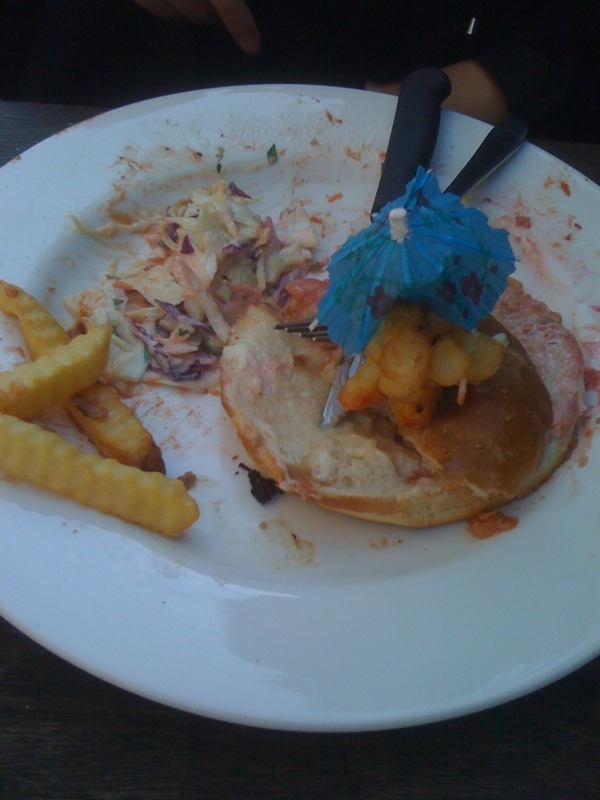 The wedge of lemon was pretty unnecessary, really, as the scampi was best eaten as it was presented. There was also a chilli crab chowder, with crispy pig’s ear flakes on top. This was quite good too, though I’m not sure how it would translate to a full bowl-sized serving. I had arrived late, so I missed the kataifi-wrapped prawn, but Jess told me it was awesome. This was all finished off with a brown ale pudding with a salted caramel sauce. Which I could have eaten kilos of; it was that good. All in all, this was a pretty impressive tasting menu – it’s being served all month as a 5 course degustation – I’m not sure which dishes will make the cut – for $80/$120 with matched wines. I don’t know about you, but this year is flying by for me. Life seems to be full of projects right now; I’ve learned a lot, and made some great new friends in the past few months. It’s an exciting thing when you encounter new people and try new things, but it often means that your old favourites fall by the wayside, and old friends who are much loved somehow get neglected. Ms A and I used to live together, first in a cosy worker’s cottage in the heart of Fitzroy, and then further out in the Crox’, where I planted my most successful vegie patch ever. She’s one of those important people in my life who I know I’ll be friends with forever. But though our friendship bonds are strong and deep, it doesn’t mean we haven’t grown apart, if only in social circles. It had been months since I’d last had a chance to catch up with her properly, so we scheduled a little dinner rendezvous in our old neighbourhood, the ‘Roy. For years, I’d heard people talk about Houndstooth, but I’d never managed to get down there. They were known for an ever-changing seasonal menu, and exceptionally good value. The menu works like this: there are four courses on offer – starters, entree, mains, dessert/cheese – and you can choose any combination of them, with a minimum of two courses. Two courses will set you back the miserly sum of $20, three courses $25, and four courses $30. It would be hard to find such good value with this style of cooking anywhere else. It’s a fairly small establishment, with only four communal tables, each seating around 8-10 people comfortably. Not being extremely hungry, we decided to just have two courses. We started with the piadina flatbread, with pickled eggplant. I had expected it to be a little thicker, like pita bread, but it was quite thin, like a more bready version of a crepe. The eggplant was nicely pickled – not too salty or sour – though I thought there was a little too much oil brushed on the bread, and it became a little messy towards the end. We also shared the Jerusalem artichoke and potato soup. This was a bit of a disappointment. While the flavour of Jerusalem artichoke was very apparent, the overall flavour was still pretty bland, and needed some more seasoning. I wouldn’t recommend you try this unless you’re a Jerusalem artichoke fanatic. After a bit of a disappointing start, we were looking forward to the mains. We’d both had trouble choosing, as there were many enticing options. It being a chilly night out, we were both in the mood for some hearty meals. Ms A went for the stifado – we both had a little giggle about the name – which was explained to us as a Greek style sweet and sour beef stew. I sampled a little, and it was indeed sweet and sour, though nothing like the Chinese version. This was much more on the sweet side, and I think it was probably honey and red wine, as opposed to sugar and vinegar. The flavour was rich and warming, and the crumbled feta added a nice piquancy to the overall dish. I find it hard to look past more unusual meats like goat when they’re on a menu. I’m not sure what it is, but there’s an allure of the exotic, I guess. This goat dish was certainly that; braised with vanilla, cinnamon and white wine. I took a moment to just inhale the vanilla and cinnamon aroma that floated up from the dish. It was soft, sweet and delicate. Not at all what you would expect from a goat dish, where so often chefs try to mask the flavour of the goat with bold spices. The vanilla and cinnamon were well balanced with the white wine, and the sauce complemented the goat beautifully. So after a shaky start, Houndstooth really managed to deliver. I mean just look at our empty plates! I think next time, we might try the desserts instead of the entree. And there will definitely be a next time soon, as Ms A and I have resolved to catch up more regularly. Because even though there are so many new and exciting things going on in our lives, it’s good to recognise what’s important, and truly good friends are certainly that. I toyed with the idea of not publishing this post because Naked for Satan has already had enough press in recent months, but I figured I really had to put my $2 in on the pintxos – “PINTXOOOOOOS!” – bar which introduced me to my latest love. He goes by the name of Pedro Ximinez. And he’s sweet as all get out. Unfortunately, he’s not all that much to look at, but looks aren’t everything, right? Naked for Satan serves up pintxos for $2 a piece. It’s like a tapas buffet plus carbs – pintxos are like a little bite of a dish served on a baguette slice – which is a great idea for a bar, but its not really somewhere I’d go for dinner. The little toothpicks which are monitored – by both cameras and security staff, it seems – are how they track how much you ate, kind of like the plates at a sushi train. They add up pretty quickly, so if you’re on a budget, you might want to keep an eye on it. I think the pintxos selection changes pretty regularly, so I won’t go too much into particular items – but if it’s on offer, try the chilli mussels, and the one with the slab of goat’s cheese. My only gripe with the way Naked for Satan works is that there’s the cold pintxos on display, but every so often, some warm/hot pintxos are brought out – canape style – which is fine, unless you miss out on them because you’ve gone to the toilet, or they just circulate in the wrong direction based on where you’re seated. Anyway, I grazed on pintxos while I was sipping on my sangria, which I was a little apprehensive about when the barman prepared it on the spot, but was actually really good! As I mentioned before, on the recommendation of one of the barstaff, I tried the Pedro Ximinez sherry. She described it as “liquid Christmas”, so who was I to object? It has since become my drink of choice to finish with – seriously, you don’t even need dessert!